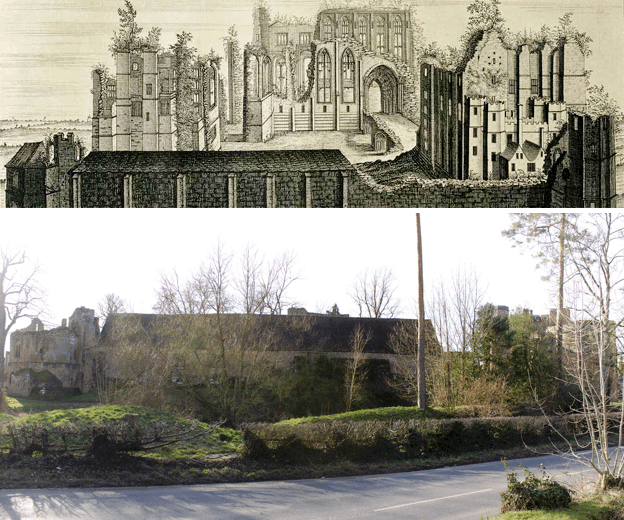 This Then & Now comparison attempts to locate the vantage point of a famous engraving, entitled The East View of Kenilworth Castle in the County of Warwick by Samuel and Nathaniel Buck. The Buck brothers set out around England in 1724 to record numerous antiquaries, including abbeys, castles and townscapes, usually under the patronage of wealthy aristocratic landowners who wished their possessions to be engraved for posterity. In this case, the patron was “…the Rt. Honble. HENRY Earl of Clarendon & Rochester, Viscount Cornbury, Viscount Hyde of Kenelworth, Baron Hyde of Hindon & Baron of Wotton Basset” who owned the Castle at the time. The accompanying text states “THIS Castle was built by Galfridus [Henry] de Clinton Chamberlain to K: Hen. I, Hen his nephew succeeding him, and having no issue, sold it to K: Hen. III, who gave it to Simon Montfort E: of Leicester, who marry’d Eleanor his sister, & rebelling against the King was slain, and at this Castle endured Six Months Siege, in the end was surrender’d, & by the King annexed as an inheritance to Edm.d Son E: of Lancaster. Q. Eliz: gave it to Robert Dudley E: of Leicester, who bestowed much cost in repairing and adorning it; which is now in the possession of the E: of Clarendon & Rochester”. It is impossible to find a corresponding viewpoint today, so it seems that the Buck brothers must have synthesised this view from drawings of individual parts of the castle using a bit of artistic license. For example, it is not possible to find a view from which The Keep lies directly behind The Gatehouse and Lunn’s Tower, as the Buck brothers depicted it here. In the ‘now’ image top of The Keep can be seen poking above the roofline of the stables in the centre of the image. Also, the detail of the stairs up to the first floor entrance to the Great Hall (since collapsed) cannot be seen from outside the castle, so must have been surveyed from within the Inner Court, with Leicester’s Stables added in front for completeness. Interestingly, the Water Tower is shown with a pitched roof, implying perhaps that it was inhabited or used as stores for the Castle’s farm estate at this time.